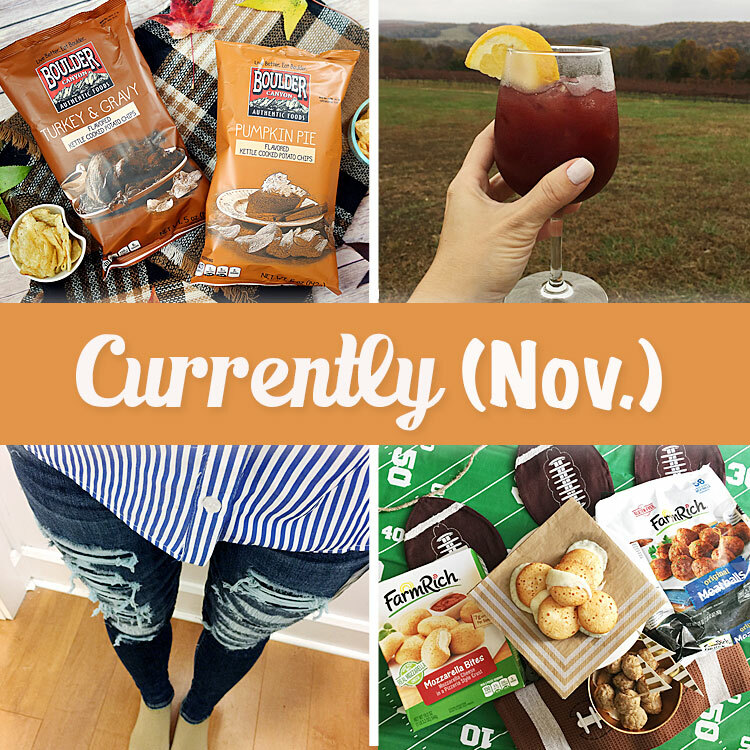 I’m back today with my November Currently post. I always enjoy updating y’all on my life happenings. Everyone has been talking about how great American Eagle jeans are and I really needed some new jeans! I was going to order online, but I was worried about sizing. So, I went into the store and I was excited that they were Buy 1, Get 1 Half Off! Yeah! I was only going to get 2 pairs… but, eek. I just loved them so much that I walked out of there with 4 pairs. I got a regular denim wash, dark wash, dark wash distressed and a black pair. Yay for new jeans! I went with the hi-rise jeggings, because the lady said those were on trend right now even more than the skinny jeans! They actually had all of the jeggings out at the front of the store and the skinny denim selection was all the way in the back. The jeggings are nice in that they fit all the way down the leg and the hi-rise helps to hold in any muffin top you may have. And, if you’re a mom and aren’t a fitness queen YOU HAVE SOME muffin top, right?! My little girl is turning 9 on Tuesday. I can’t believe my YOUNGEST now is almost in the double digits. It really makes me want to have another! I have been preparing for her birthday and she’s been wanting these JoJo bows. There is the dancer/YouTuber, etc. 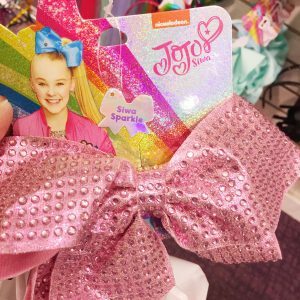 named JoJo that is a 14 year old that makes and sells her own bows and has a bow line at Claire’s. They are really big, Southern belle style bows and they sell for $17 a pop! Although, I have heard you can find them at Five Below stores for $5! MUST Try Fall Crock Pot Recipe! When we have busy weeks, I try to make crock pot dinners! I tried the BEST crock pot recipe that I think I’ve ever, ever made this week. 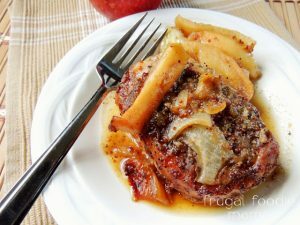 Frugal Foodie Mama Slow Cooker Apple Butter Pork Chops. SO good. You can find the recipe in my Pin Board: ‘This Weeks Meals: As Seen on IG Stories‘. The Creamy Velveeta Cheesy Chicken Chili crock pot dish is also delicious! Be sure to follow this Pin Board if you don’t want to miss out on any recipes I try… or, just follow me on Instagram Stories! Brian and I stayed at a winery in Sainte Genevieve, Missouri a couple of weekends ago and I was going to give a recap of it in this Currently post, but I think it’d be best to do a separate post for it! 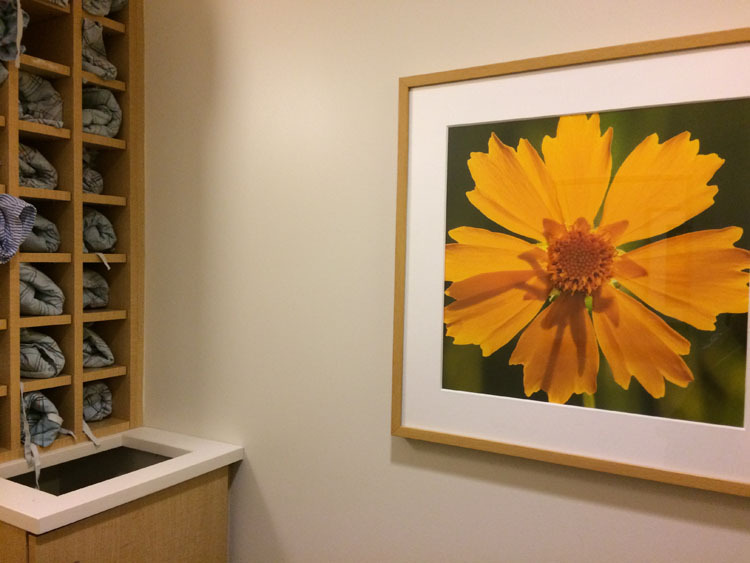 I don’t have a TON of photos, because we were only there 2 nights… but, I do like to document our trips on the blog! I won’t say much here, but it is so nice to catch up every so often and I love our little trips we take away together. It is so easy to get caught up in the day to day routine, especially when you have kids… Now I just need to plan our next outing! This month I read one book. This is a love story between Fallon and Ben. Fallon meets up for breakfast with her father on the anniversary of the fire that she was in as a child, November 9. This fire caused severe scars on her face and body and she lost a lot of her confidence. Ben and her connect during breakfast and then land up spending the rest of the day together in L.A. They decide to meet up again, 1 year later on the same date and will continue this for 5 years. A lot of changes happen in these 5 years, including the first year where Fallon moves across the country to New York. She tells Ben to write a novel about their love and yearly meet ups and Ben gives her ‘homework’ to do as well. However, a major twist in the plot happens and Fallon isn’t sure if Ben is telling her the truth about himself and if he’s just using her to make his novel more interesting. This book really kept be guessing and I really felt a lot of emotion between the two characters, definitely a must read! 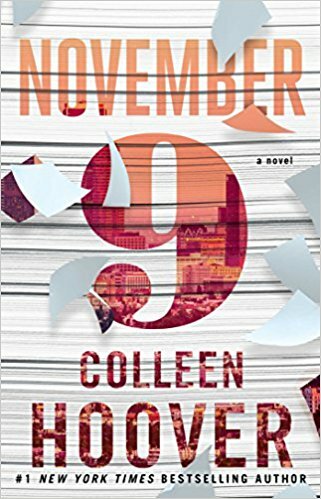 Colleen Hoover also wrote ‘It Ends With Us’, which is another fantastic read! 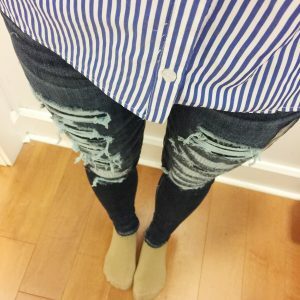 Now I have some products I’ve tried recently to share with y’all! I have always loved The Body Shop, especially their cult status Tea Tree Oil! 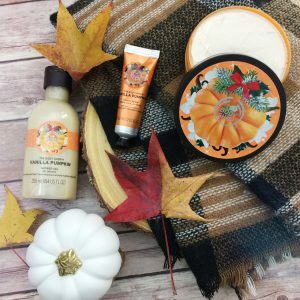 I was beyond excited when they sent me their new Pumpkin Vanilla products! They asked me to share a little about what my senses think of the fall… and, I would have to say that the fall is one of my favorite seasons and there are so many smells, sounds and sights associated with it! My fondest memory was the birth of my daughter, who I even named Autumn! But, lately I’ve been all about pumpkin spice everything! I love the fall flavored coffee drinks, such as pumpkin spice, s’mores, etc. and I enjoy drinking them in my fall mugs. Apple cider is also tasty… can you tell I am big on fall drinks? I’m also about everything cozy. I am reading a book about hygge right now and all things cozy! I enjoy fall scented candles, the smell of s’mores and fresh popcorn popping… any fall baked treats and pies galore. For activities, I always look forward to my fall half marathon and one of these days I’d love to do a turkey trot. 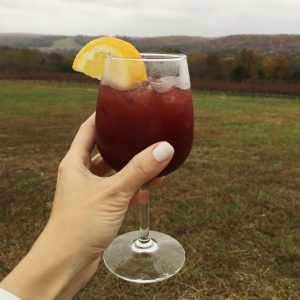 I enjoy the leaves when they start to turn… my husband and I went on a little getaway to a bed and breakfast at a winery 2 weekends ago and really got to enjoy all of the fall color at the prime time! 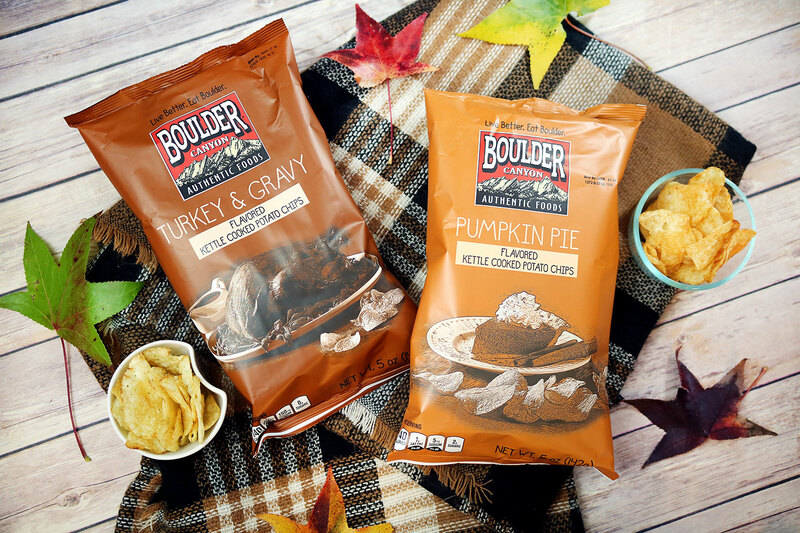 Boulder Canyon sent me some Thanksgiving chips to try out. They sent me their Turkey & Gravy and Pumpkin Pie flavored chips. These were DELICIOUS! I brought 2 bags to trivia night last month and then I plan to bring another couple of bags to one of our Thanksgiving gatherings. You can find these chips on Amazon (and yes, you can get them with Prime!). You can also find them at Target and there is a Stuffing and Cranberry variety! 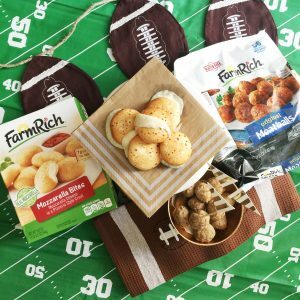 Home gating is the new tailgating, it is so easy to stay home and enjoy a delicious spread of foods than all the hassle it can take to get to a game. FarmRich makes it easy with their large selection of appetizers. Recently, we enjoyed their Mozzarella Bites and Original Meatballs at home. Country Crock® Unsalted Buttery Sticks and Bigelow® Benefits Ginger & Peach Herbal Tea and in Lemon & Echinacea Herbal Tea. I’m looking forward to trying the rest of these products! 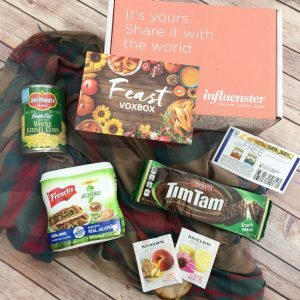 I received this Vox Box free and I am sharing my honest opinion on these products.